Hextor has been discontinued by Milford Instruments. 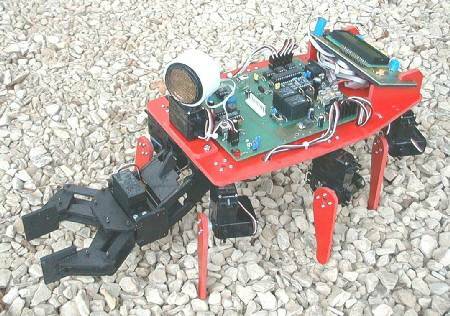 Designed by David Buckley and based around a Parallax BS2sx processor, easily programmed in Stamp Basic, the Walker comes with fifteen servos, twelve for the six legs, two for the gripper/lift and one for scanning with the Polaroid ultrasonic range-finder, power is supplied from a standard 7.2volt Nicad pack. The user programmable BS2sx is in overall control of nine co-processors. One deals with the keypad and LCD, one controls the ultrasonic range-finder, one looks for infra-red control commands from a standard (tv/video/hi-fi) remote control, while the main one runs Milford's Bug Commander Behavioural Operating System (BOS) which in turn has five co-processors running the servos. The removable board with the keypad and LCD can be used via a short umbilical for direct control of Hextor. For schools and novices there is a suite of over thirty BS2sx programs which show how to use all the features of the robot using the simple commands built into its operating system. The programs take you through all the steps required from flashing the LEDs to a full Behavioural Control program. The BOS firmware commands enable high level control, of walking using both Tripod Gait and simple Wave Gaits, and also the gripper/lift. The commands use simple ascii codes. eg "F" - Forward, "B" - Backward, "R" - Right turn, "L" - Left turn etc. Full control is available through these commands for adjusting the speed of the servos, the ride height, leg lift when walking, stride length and more, including direct control of each individual servo and interrogation of each servo's status and position in order to allow users to experiment with complex gaits and to have fine control over the gripper/lift. The fully commented Behavioural Control program (BC) for the BS2sx, written in Parallax Basic, allows the walker to be controlled from the keypad or a standard infra-red remote control, to jump to routines allowing the walker to wander about under program control using data from the Ultrasonic Rangefinder, or to execute user behaviour routines held in the BS2sx's internal EEPROM. The behaviour routines are run by a powerful extendable script engine which handles sensor testing and high level sequencing by using the high level ASCII commands already built into the BOS firmware. All the electrics and electronics may be shut down by the user program in the BS2sx microcontroller and the BS2sx put in sleep mode reducing the current consumption to a few microamps. Included on board are two LEDs for status indication, a sounder, two whisker connections and a bytewide header for other sensors and communications links. A range of daughter boards are available which plug onto the header and provide extra functionality such as voice control and prototyping areas. Since the walker comes ready equipped with an ultrasonic range finder and has a 300g/10oz gripper payload, the combination of the powerful BS2sx BC and the Bug Commander BOS means you can have your ALife research project up and running in short order. Hextor is available from Milford Instruments. Standard Included Servo Controller:	5 off - Milford intelligent 3-servo controllers, Serial, and can be interrogated for servo position. Prototyping Area for additional Electronics:			Bytewide Expansion connector to PortB of BS2sx - allows off board prototyping. and allows high level programs to be constructed in the included BS2-SX Stamp. Direct control of the servos is included for advanced users. 7.2V Nicad pack and charger.